Post your DIY aero pics - Page 2 - Miata Turbo Forum - Boost cars, acquire cats. How much does the angle of the splitter affect the performance? Is it better to have the nose slightly lower or is it better to keep it level with the ground? It's hard to compare the aero of an F1 car to that of a diy miata setup. Totally different ball game. But to answer you question I'm talking about a different type of deflection. The goal with the front wing deflection on the red bull was to get the front wing element closer to the ground which would produce more downforce. The mounting of the wing however was not designed to deflect. If it was, then the downforce produced would be wasted and not translated into increased vertical load on the tires. This article actually explains it quite well. So yes, deflection of the actual aerodynamic device can be used to your advantage, but if your goal is more vertical load on the tires, then the force it's generating has to be translated to the wheels effectively. If your splitter makes actual downforce and that downforce is only used to bend your bumper, then it's really not helping you at all is it? I see, I figured it was something more specific than deflection in general. Thanks for the explanation. Must be level with the ground. Unless you want tons of drag along with your downforce. Also messes up the other benefits of a splitter if its not level. Last year I had just the GTC-200 and the rear became very stable (compared to no aero). With the wing slight understeer. 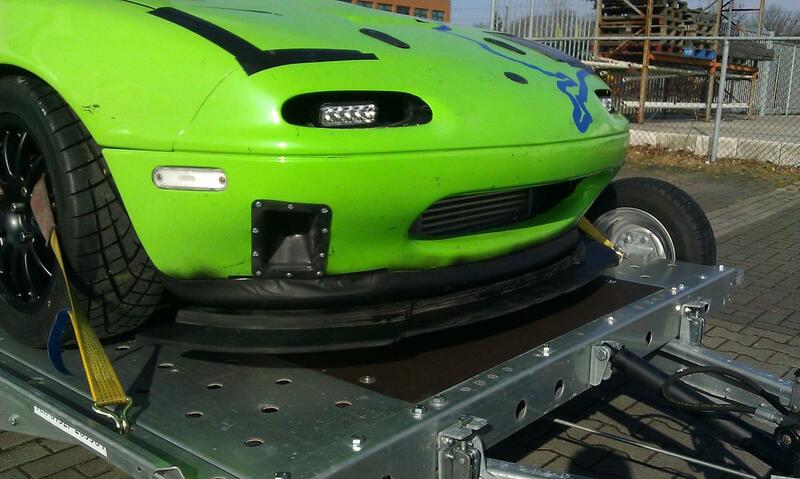 Now with the splitter, car turns in sharply and the rear is more loose. Needs more testing with more AOA in the rear. How effective: I hesitate to say without real testing data, but enough to seriously unbalance the car. I spun at every event I've been at since putting it on. I'm finally getting my head out of my a$$ as putting a wing on to balance it out. Materials used: Birch ply for the splitter. ABS plastic for the air dam. Bracket location: 2 bolts @ back of subframe. 2 turnbuckles on the sides (in front of each wheel, just inside the air dam), 2 turnbuckles in front. Race/TT class built for: SCCA SSM Time Trails and Hill Climbs. Last edited by Handy Man; 03-12-2012 at 08:23 PM. A quick and dirty band-aid aero is a sheet of coroplast hose clamped between the roof and roll bar hoop. 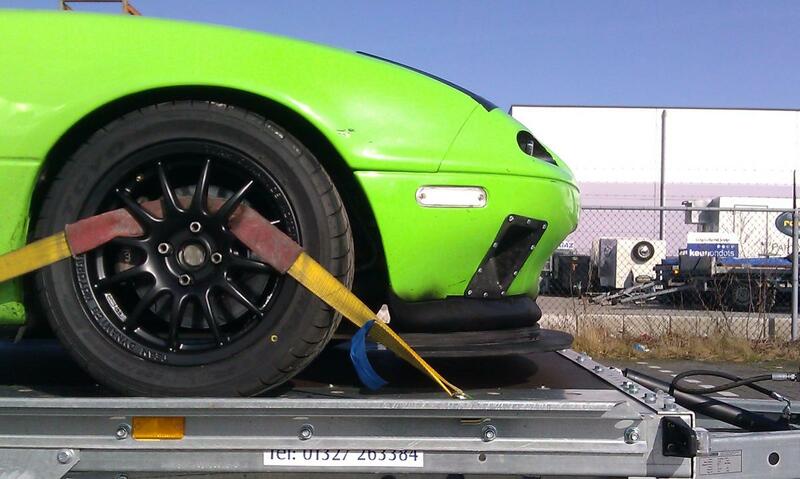 We tested it on a chump car in it had a bit more top end speed and back end was less loose. Also keeps the sun off you if nothing else. Maybe William or Sonny have a pic they can post. Here's the top in question. For the guys with plywood splitters, do you do anything to it to help make them more water resistant? How would this hold up on a rain day? heat, tar, oil resistant spray paint. Other than that I expect water to be the least of my worries. I paint the top side with cheap solid black wood stain. I do not bother staining the bottom most of the time since there is a good chance it will be scraped off anyway. I've had my 3/8" birch plywood splitter at one really wet event and a couple of other damp events. So far, no problems. FWIW I do not leave it out in the rain. Mostly it is in the garage between races. Spraying it with a water sealer like Thompson's might be worthwhile. Mine has been soaked in rain more times than I can count and there are no significantly ill effects. It is covered in ~$3 worth of spraypaint. I daily drive my splitter and i coated both sides with fiberglass resin then some black paint and other than some bottoming out on the street it has held up fine all last summer. see location im local to you so same weather. APR Performance 2D wing. We made our own mounts. Not pretty but, functional. Very interesting video, very well explained! i just want to add that my mpg went up about 2-3 mpg with my undertray from page one. testing was accurate as its gonna get. We have seen the same thing on other cars. Front under tray is far more effective that most people my guess. Is there a recommended height off of the ground a splitter should be? lower is better as less air can flow under the car. there is an optimal distance off the front of the car though.